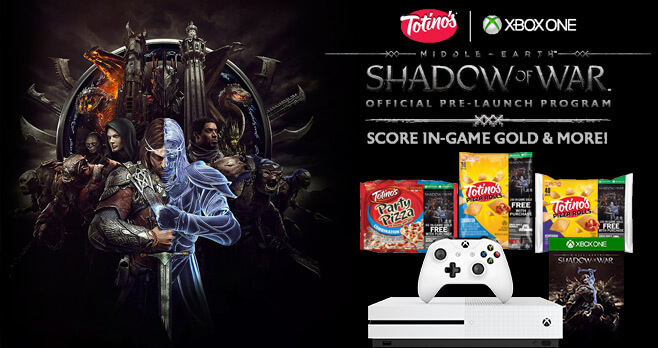 Upcoming action role-playing video game Middle-Earth Shadow of War and Totino’s are teaming up to give fans the chance to win an Xbox One S bundle. Go to ShadowOfWar.Totinos.com and register to begin your quest. Plus, gather codes from participating products to unlock in-game gold. Totino’s Middle-Earth: Shadow of War Sweepstakes is open only to legal residents of the 50 United States and the District of Columbia who are at least 18 years old at the time of entry. The Sweepstakes Period begins on September 1, 2017 at 12:00 a.m. CT and ends on March 31, 2018 at 11:59 p.m. CT.
During the Promotion Period, visit ShadowOfWar.Totinos.com and follow the links and instructions to complete and submit the registration form including a valid home address. Click on the “ENTER HERE” button on the Website. By doing so, you automatically will receive one entry into the Sweepstakes. You may enter one time per day during the Promotion Period. Administrator will randomly select the potential Sweepstakes winners from all eligible entries received during the Promotion Period, on or around April 2, 2018. The potential winners will be notified by email, mail or phone. THIRTY (30) GRAND PRIZES: Xbox One S console; Xbox One controller; t-shirt; and Middle-Earth: Shadow of War Xbox One digital game code. TWO HUNDRED FIFTY (250) SECOND PRIZES: Middle-Earth: Shadow of War Xbox One digital game code and an Xbox One controller. Total ARV of all prizes is $43,094.10. For a list of the Sweepstakes winners, visit http://bit.ly/2tJNtnR. The winner list will be posted after winner confirmation is complete.